The Signature Challenge, in which the baker uses a tried and tested recipe adhering to the episode's theme. For instance, in the case of the Pies and Tarts episode in the latest season, competing bakers had to create their signature pie for this challenge. The Technical Challenge, in which the baker is given a recipe provided by the judges. The recipe, however, is incomplete and is designed to test the knowledge and skill of the bakers by forcing them to improvise and use their judgement accordingly. Unlike the other two challenges in which the baker has been told beforehand what the challenge will be, the baker has no idea what this will be. In the Pies and Tarts episode, bakers had to create miniature custard tarts (which are a lot harder than they sound). This challenge tends to involve really finnicky recipes like angel food cake, English muffins, and floating islands. The Showstopper Challenge, in which the baker bakes a crazy/awesome/impressive recipe of their choosing (related to the episode theme, of course) in order to impress the judges. In the Pies and Tarts episode, bakers had to make their own filo dough from scratch and create a filo pie. Watching the first few episodes, I was appalled at some of the mistakes I saw the bakers making. Many turned their cakes out from their tins by flipping their cake pans violently and just catching them on their wire racks. I cringed at the screen and thought that the bakers were leaving way too much to fate. To wit — I flip my cake tin with the wire rack right over the opening, so that it travels the smallest amount of distance it needs to and falls directly into the pan. There was also another particularly dreadful challenge in which none of the bakers had lined their tins with parchment paper, leaving them to haphazardly saw out a delicate tart crust that had stubbornly stuck itself into the pan. Unsurprisingly, the resulting tartlets were broken, uneven, and ugly. As I pointed these mistakes out to Kiron, he scoffed at me. "Oh please, Michelle," he said. "Mary Berry would eat you alive." During the Cakes episode, all bakers had to make a chocolate cake for their Showstopper Challenge. My housemates and I watched in fascination as the contestants came up with crazy ideas like embedding a chocolate squirrel into the center of a cake (a surprise for when you cut into the cake, I guess) and building a chocolate structure inspired by the Sagrada Familia in Barcelona. Most of the cakes paired the chocolate with a fruit like orange, cherry, and passion fruit. Almost all were over the top with elaborate, intricate designs. I pointed this out to my housemates, who I had also gotten hooked on the show. "It's a shame, really. Why are the contestants trying so hard? I mean... it's chocolate. It's good enough on it's own. 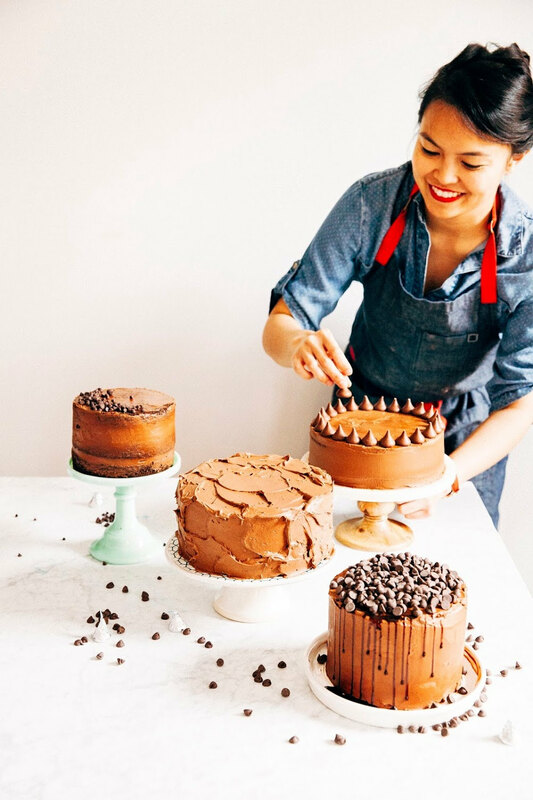 I can make a better chocolate cake without too many other additional flavors or incredibly fancy decorations." My housemate snorted. "Oh yeah. Prove it." That was the second time my baking skills had been challenged by the damned show, and I wasn't going to stand for it. "Fine," I said, jumping up and storming to the kitchen. I threw open the cupboards and sorted through the ingredients I had on hand: bags of white chocolate chips (since I rarely bake anything with white chocolate), some malt powder from an abandoned baking idea, and finally, a bag of forgotten white chocolate Malteser malt balls from my latest trip to the Netherlands. Or, as I like to describe it: all white everything cake. 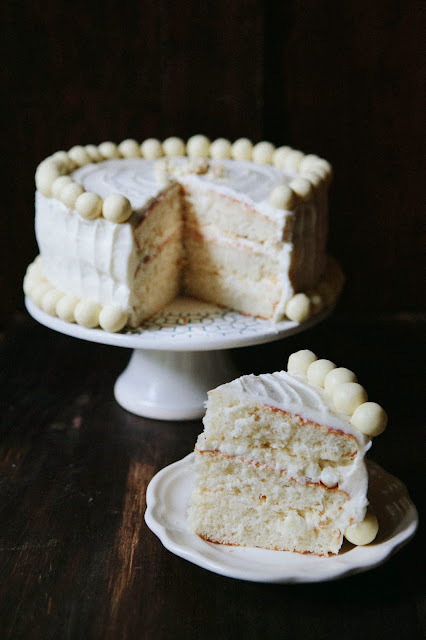 Beautifully even layers of white cake soaked in malted milk, sandwiched between white chocolate chips, white chocolate frosting, and white chocolate malt balls. What I really like about this cake is that white chocolate is obviously the main star — although the cake does have malt, it's simply there to compliment and enhance the chocolate. And as for the frosting job, I stuck with my signature swirl and neat lines on the side of the cake. All I needed was an offset spatula to finish the frosting off with some lines and spirals. "HA!" I yelled triumphantly as I brought out the cake for my housemates to see. The stunned looks on their faces showed me that they were impressed. "Now who says I wouldn't do well on the Great British Bake Off?" Neither of my housemates responded. They were too busy stuffing their faces with cake. Ha, I thought to myself. I think I won that one. Up next was my friend Kiron. I sent him the following instagram picture of the cake in its full glory. "Take that, Mary Berry," I typed. There was a pause. Then my phone buzzed with life. Kiron had responded: "Yeah, she can go do one." White chocolate Maltesers are European white chocolate malt balls similar to the US's Whoppers. They're admittedly a little bit of a pain to find, but you can find a small bag on Amazon or a specialty European grocery store. Alternatively, you can find generic, non-branded versions online at Oh Nuts or the Candy Warehouse. 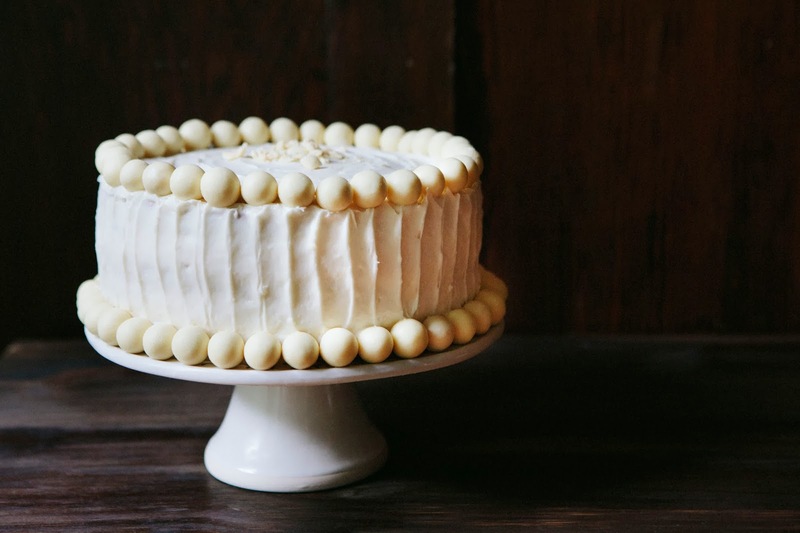 The cake gets its white color from the fact that there are no egg yolks in the cake. Be sure to separate your egg yolks from their egg whites properly to get the whitest cake possible. This cake has a cake soak step in which you soak the layers of white cake with malted milk. I know that a soak sounds really excessive, but the first time I made this cake it wasn't moist or malty enough. The soak fixes this problem, so please don't skip it! Preheat the oven to 350 (F). Prepare three 8-inch cake pans by spraying generously with cooking spray and lining the bottoms with parchment paper rounds. Spray the parchment paper with cooking spray. In a medium bowl, whisk together 3 cups cake flour, 1 tablespoon baking powder, 1 tablespoon malt powder, and 3/4 teaspoon salt. Set aside. In the bowl of a freestanding electric mixer fitted with a paddle attachment, combine 3/4 cup unsalted butter, 1 1/2 cups granulated sugar, and 1 tablespoon vanilla extract. Beat together on medium speed until well combined. Reduce the mixer speed to its lowest setting and add 4 egg whites one at a time, only adding the next egg white when the previous one has been fully incorporated. Do NOT overmix — only beat until just combined. With the mixer on its lowest speed, add the flour mixture (from the 2nd step) in three parts, alternating with 1 cup whole milk in 2 parts, beginning and ending with the flour mixture. Again, do NOT overmix — only beat until just combined, adding the next ingredient only when the previous one before it has been incorporated. Once the mixture has come together, divide the batter evenly between the three prepared pans and bake for 22 to 25 minutes, or until golden and just firm. A toothpick inserted into the center should come out clean, and the tops of the cakes should bounce back when gently poked with your finger. When the cakes are ready, let cool in their pans on a wire rack for 15 minutes, before inverting the cakes out to cool completely. Gently peel off the parchment tops and discard. Once the cake layers have cooled, make your cake soak by whisking together 1/2 cup whole milk and 2 tablespoons malt powder. Place the cake layers on a baking sheet and use a fork or a skewer to poke the tops of each cake all over. 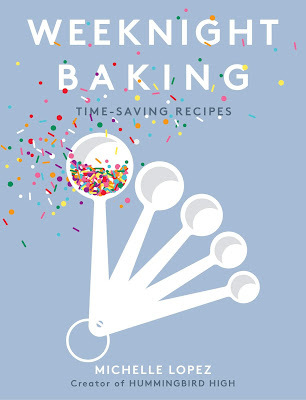 Use a pastry brush to gently brush the tops of each cake with a generous portion of the cake soak. Cover with plastic wrap and cool in the fridge for 1 to 3 hours. Combine 6 ounces finely chopped white chocolate and 2 tablespoons unsalted butter in a microwave-safe bowl and microwave until the two are melted, using a rubber spatula to stir every 15 to 20 seconds. Be careful not to burn your white chocolate — simply set the microwave for 15 to 20 seconds each time, and stir the chocolate in between each heating interval. In the bowl of a freestanding electric mixer fitted with a paddle attachment, combine 8 ounces cream cheese, 1 tablespoon malt powder, 1 teaspoon vanilla extract and a pinch of salt. Beat together on high speed until smooth, about 1 to 2 minutes. Reduce the mixer speed to low. Add the melted white chocolate mixture (from the 1st step) and beat for about 30 seconds. Scrape the bowl, before gradually adding 3 cups confectioner's sugar on low speed. Continue beating until blended. Scrape the bowl again, before increasing the mixer speed to high and beating for another minute. Place your jankiest layer on the cake plate and use an offset icing spatula to spread 1/3 cup of white chocolate frosting on top. Sprinkle the top with 1/3 cup of white chocolate chips. Place the second layer on top of the chocolate chips, and repeat the process. Finally, gently nestle your best layer for the top layer and use the remaining frosting to spread to cover the sides and the tops of the cake. 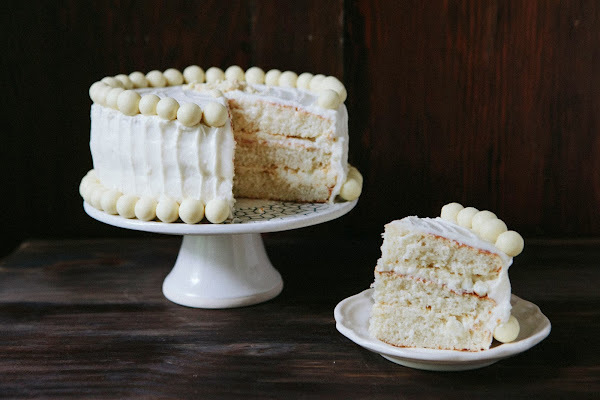 Line the bottom of the cake with white chocolate malt balls, before lining the cake's top circumference with the remaining white chocolate malt balls. This looks delicious! I love the malted flavor, so I'll have to give this a try sometime. I love white chocolate Malteasers. Cake looks good. LOL I'm addicted to that show as well! I always imagine what I would do if I'm ever in the bakers' shoes. 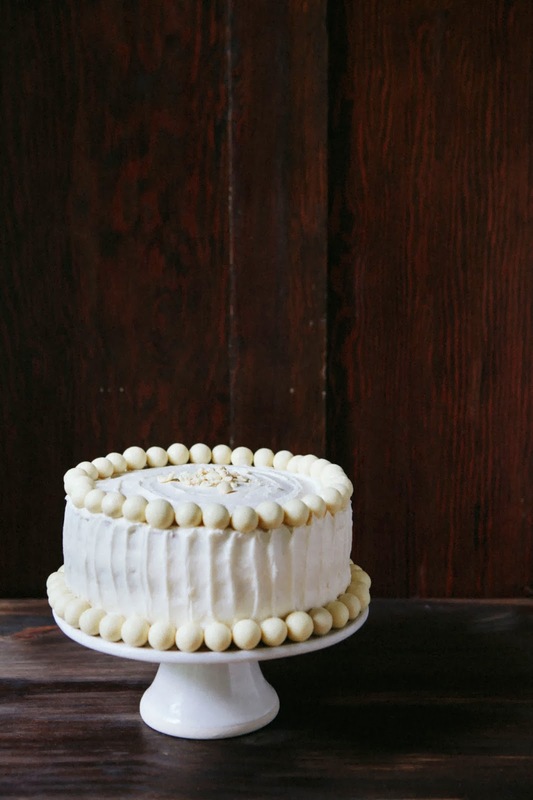 Love your white chocolate malt recipe, perfect for a birthday cake! I am CRAZY addicted to it! I've determined that I'd most likely be eliminated early since most of my desserts are probably too plain for the judges' tastes. I would love to make this one day in advance before serving, any suggestions? Nope! Just make sure that the cake is well covered since it has a tendency to go stale quickly. Let me know if you have any more questions. Clean cake photos, I dig it. 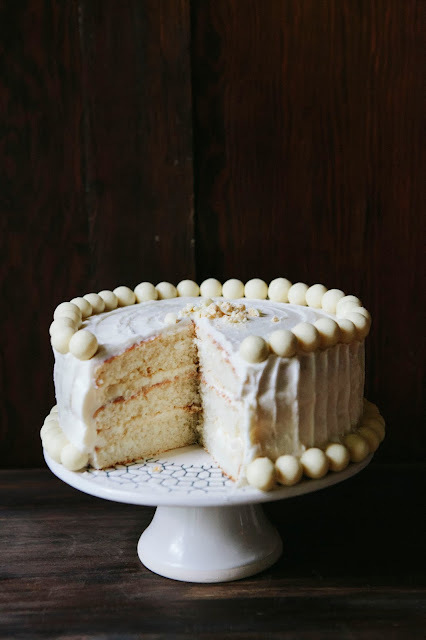 Making this for my husband's 50th b-day as he loves malt and requested a white chocolate cake. When you refer to malt powder, do you mean malted milk powder? If not where do you get malt powder? Yep, malted milk powder should do the trick! Gorgeous cake! I love your decorating technique.